Next, we compared Oracle database configurations by selecting Enterprise | Configuration | Comparison and Drift Management from the Enterprise Manager console, and creating a comparison. We selected the on-premises 12c database “ahuprod.sainath.com” and the Cloud database AHUTEST. Effectively, we compared the configuration of a local on-premises database with that of a cloud database. This comparison can be done at the server level as well, and configurations at a certain date and time can be saved as a “Gold” configuration to compare to current configurations at regular intervals, to detect configuration drift. 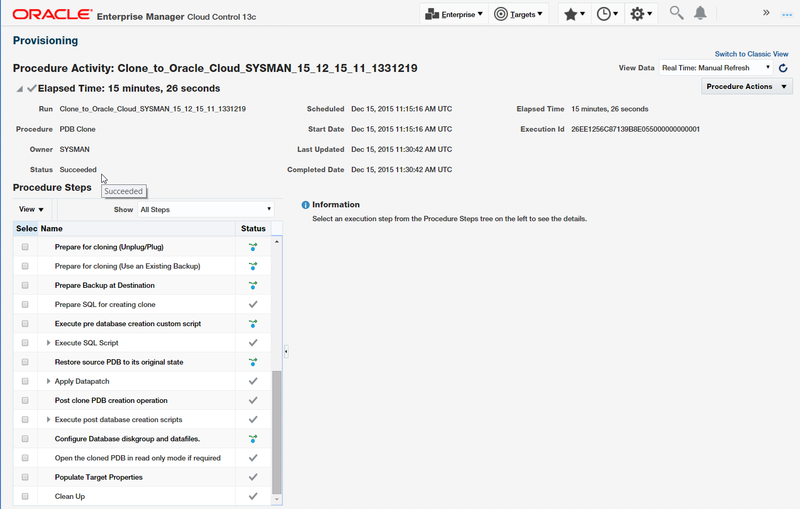 Oracle Enterprise Manager is also able to enforce the same compliance standards on the Oracle public cloud as well as on premises, which is perfect for a hybrid database setup. Then, we looked into the cloning of PDBs from on premises to cloud, one of the main features of the hybrid cloud. To proceed with the actual PDB cloning, we made sure the source and destination CDBs were at the latest PSU. We then went through the steps to preserve the Enterprise Manager agent home when patching the cloud database. Next, we started the Clone to Oracle cloud process. This was done via right-clicking on the on-premises PDB “SALES”, which is in the ahuprod CDB, and selecting Oracle Database | Cloning | Clone to Oracle Cloud. The name of the destination PDB on the cloud side was entered as “SALESTST”, since this will be a test pluggable database. We also selected a user name and password for the PDB administrator of the new PDB. Then, we could have clicked on “Clone” to start the procedure, but instead we clicked on the “Advanced” button at the top of the page. This switched to advanced mode, and a multiple page workflow appeared on the same screen. We clicked on Next. 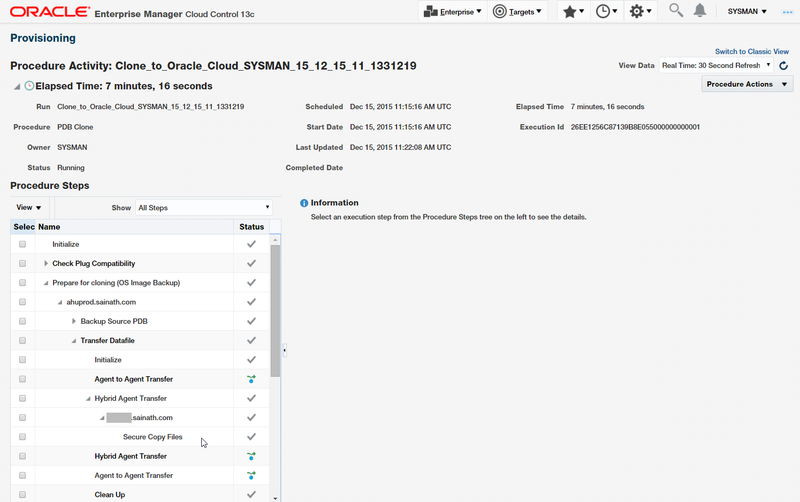 The “Clone to Oracle Cloud: Configuration” page appeared. As per cloud database standards, based on Oracle Flexible Architecture (OFA) standards, the PDB data files will reside on /u02, in the /u02/app/oracle/oradata/<PDB name> directory. You can also enter storage limits if you wish, such as the maximum PDB size or the maximum shared TEMP tablespace size. The default logging attribute for tablespaces creating with the PDB can also be specified – Logging, No Logging or Filesystem Like Logging. After this, the Post Processing page appeared. This page showed us the importance of the Advanced mode, since it is possible to select a Data Masking Definition if it has been created for the source database. Masking is seamlessly integrated with Enterprise Manager. This makes sure that confidential data is masked when being cloned from an on-premises production database to a cloud development database. In the Schedule screen that appeared next, you scheduled the job and could also choose to be notified on a certain status such as Action Required, Suspended or Problems. Click Next. Finally, the Review screen appears (Figure 31). Review the information, and click on Clone. The procedure starts to execute (Figure 32). In the list of Procedure steps, we can see a Secure Copy files step. Note that the “rsync” UNIX command is being used by the procedure to fast-copy files to the cloud. The clone to cloud completes successfully in under 16 minutes (depending on the PDB size and the Internet connectivity), as can be seen in Figure 33. You can examine each step and its output if you wish. 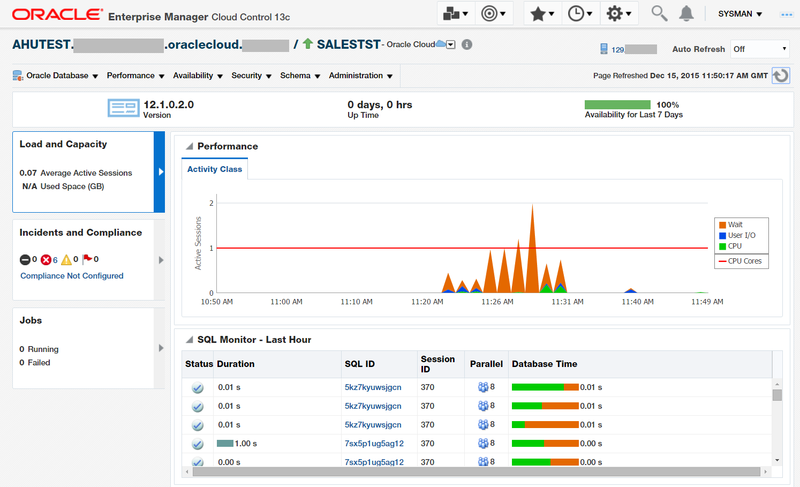 When you move to Targets | Databases, you can now see the new SALES Test PDB under the cloud CDB AHUTEST. This is seen in Figure 34. Drill down to the Sales Test PDB Home page (Figure 35). Here we can see the newly cloned SALESTST PDB merrily working. We continue examining this PDB in the next part of this article series.